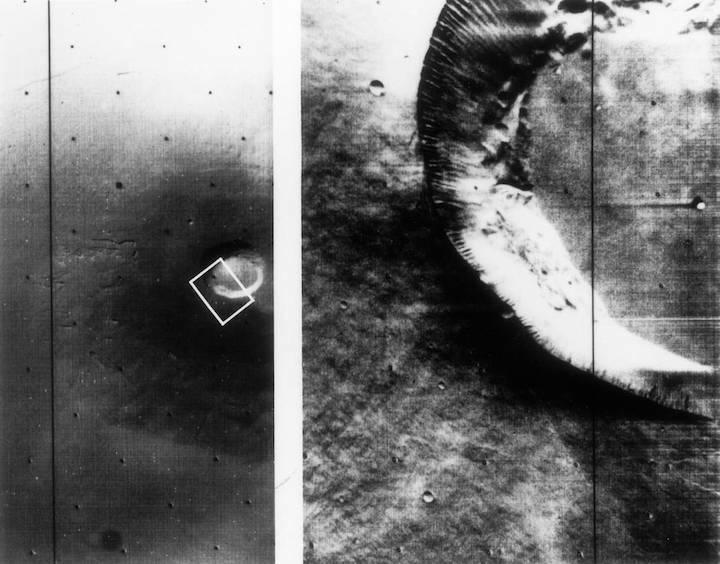 On November 14, 1971, Mariner 9, the first spacecraft to orbit the Red Planet took this and other images of a Martian shield volcano, approximately 25 miles across at the crater. The images were photographed consecutively with the craft's wide-angle and telephoto lenses. The summit crater and grooves down the flank probably were produced by subsidence flowing subsurface movement of magma. Mariner 9 was also the first spacecraft to orbit another planet and was designed to continue the atmospheric studies begun by Mariners 6 and 7, and mapped more than 70% of the Martian surface.